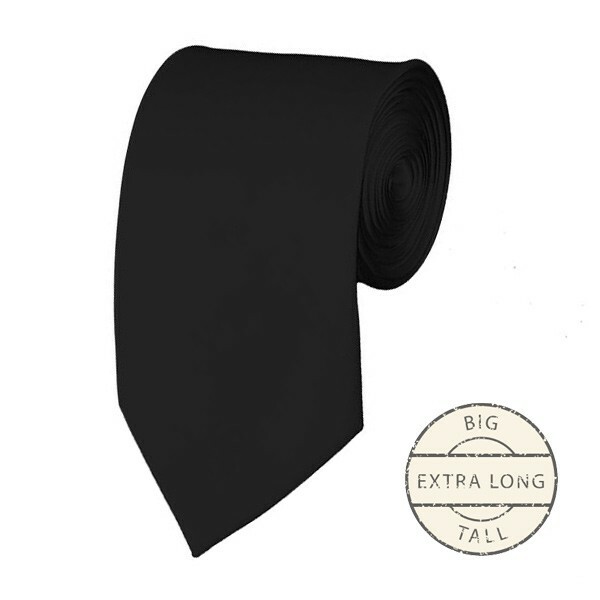 This extra long solid black tie is for the big and tall guys. Our black solid colored neckties have proven popular with schools, choirs, sports teams, embroiderers and individuals looking for a basic tie at a discounted price. Sporting a luxurious satin finish with just the right amount of sheen, our solid black 3 and 7/8 inch necktie features a full lining to provide superior body & feel to the necktie, allowing it to make excellent knots and last for years of service. This black tie is extra long and is scaled to match the current fashion trends, when worn by a big and tall guy. This means that this extra long tie has a traditional tie shape and would look great with a jacket or without.